It’s not your all-important FICO score, but it can provide you with very important information. This guest post comes from Jonathan at My Money Blog. 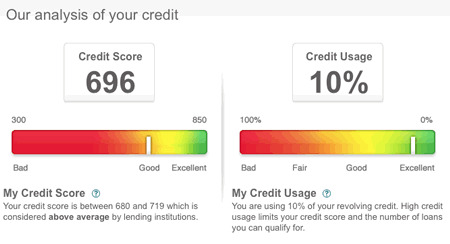 Another new website, Credit Sesame, now offers you free credit scores and updates based on your Experian credit report. No credit card required, no trial required. This is not a real FICO score, but an estimate of the FICO formula that uses the same range of 300 to 850. To avoid repeating myself too much, you can learn more about FICO vs. FAKO credit scores here. Sign-up process. The sign-up process was quick and relatively painless. They ask you for your home address and household income, but this is primarily to see if they can save you money on a mortgage refinance. (This is one way they make money.) You’ll also need to answer three questions based on your Experian credit report data to verify your identity. Online security. To get your credit score, you will need to give them your Social Security number. You’ll have to decide for yourself if you feel comfortable doing this. They do claim all of the usual security measures, including 128-bit SSL encryption, password encoding, and working with Experian to test their systems. They also do not sell personal information, but will use it to target potential offers to you. The information that you provide — including name, date of birth, email, real estate ownership, home address, Social Security, and any information about your finances (income, assets, debt, credit) — is not sold to third parties. Why the big difference? After some research, I finally remembered why my Experian score may be lower. More than two years ago, I found out my old library sent me to collections over a $40 overdue book that I returned. This annoying ding only shows up on my Experian report. Post continues after video. This entry was posted in Credit Scores, FREE and tagged CREDIT, CREDIT SCORES, debt consolidation, Easy Loans, fast cash, FREE CREDIT SCORES, mortgage, mortgage money by burtkauf. Bookmark the permalink.